Cup with apple Samsung mobile payments to advance to fight back to win the geometry? December 12th, China UnionPay announced to join more than 20 banks to launch mobile NFC based payment technology in the near field of the cloud flash pay". Less than a week's time, the Union and the and the Apple Corp and Samsung Electronics are Pay Apple and Pay Samsung cooperation, the fastest in the beginning of the year to provide a security chip based on apple and Samsung mobile devices to provide payment functions 2016. At the end of 2015, China UnionPay has high-profile mobile payment counterattack horn sounded, facing the previous third party payment staking, already late admission to the union, whether the two strong pattern of breakthrough Alipay.com, micro channel payment? With the mobile phone manufacturers to Jones cooperation is winning? In recent years, the rapid development of China's mobile payment market. The central bank released data show that China Mobile payment business has been for two consecutive years, the growth rate of over 100. 2014, China Mobile payment services, a total of pen, the amount of up to $, an increase of 170.25 and 134.30 respectively. In such a high growth market, the relationship between the bank and the mobile terminal third party payment is more closely, and then gradually alienated cooperation with China unionpay. "This makes the Union had to launch a program to maintain the relationship with the bank." Chinese Academy of Social Sciences Research Center of Information Technology Secretary General Jiang Qiping said, through the observation of the bank in today's environment, more inclined to work with the front desk to pay institutions to cooperate with each other, which provides background support for the Union has brought no small challenge. On the other hand, with the gradual opening of China's payment clearing industry, China UnionPay has occupied a monopoly position to feel the pressure. According to Internet research firm Analysys International released data, the three quarter of this year, Chinese UnionPay's third party payment cup business in the mobile payment market share of only 0.49, while Ali's Alipay.com and Tencent's TenPay market share is as high as 71.51 and 15.99 respectively. In front of the pressure, the cup also really have to active action. Before the emergence of the third party payment, clearing and payment business is relatively independent, UnionPay at the end of the liquidation occupy monopoly position, lying can be money profit model the ignore the rise of emerging markets. "In today's market form, clearing and payment is not separation. Cup 'big brother''s position to make it after the discovery of the clearing market has been eroded, so as to miss the opportunity to point the world, Jiang Qiping pointed out. Enter the field with UnionPay can open a situation of tripartite confrontation pattern? The "giant" UnionPay's presence will shake Alipay and micro channel TenPay hutch hegemony situation? Ai Mei consulting CEO Zhang Yi believes that UnionPay has a high landing rate and guarantee the financial security of the state-owned background, coupled with the user's high recognition of Apple products, the two phase combination will inevitably have no small impact on China's existing mobile payment market. 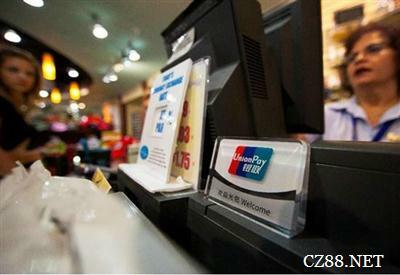 "The payment system now almost every store business with UnionPay, which is Alipay and micro channel payment online than. And this is a great advantage for the pay Apple and apple cooperation." "I think in the future, the formation of UnionPay, Alipay.com, micro channel payment will be a situation of tripartite confrontation in this market situation." Zhang Yi further explained that the Alipay and micro channel is now occupy most of the market, the formation of a relatively stable situation, it has a relative monopoly position in the remote payment, is not easy to shake. But online payment, UnionPay's high popularity rate makes it have a natural advantage, the market won a trump card to capture. But Jiang Qiping believes that now is premature to predict its success. "Cup with apple, Samsung in the mobile payment cooperation in this model is not a problem, but the success of a project is the result of a number of common factors. If the flaws in the actual implementation and other aspects, will bring great risks for the program." At the same time, Jiang Qiping also in the year of cooperation with apple as an example to explain, when China Unicom and Apple also has a very good start, but the final loss of 6 billion 900 million yuan unicom. The reason is China Unicom's core executive ability and the company is far lower than Apple's body mass, when the focus of the two parties appear different, China Unicom will be Apple led by the nose. To a certain extent, this is quite similar to the cooperation with apple today is quite similar to apple." Samsung Pay finally landed in UK support model exposure!